Family Questions Police Shooting of Black Man in Calif.
Family members and attorneys are disputing the official account of a fatal police shooting of a 26-year-old black man during a traffic stop this month in Barstow, California. Authorities say Diante Yarber was shot April 5 as he drove the car toward officers in the Mojave Desert city. The incident was partially recorded on cellphone video. Attorney S. Lee Merritt, who represents Yarber's family, told the Los Angeles Times the car was barely moving. 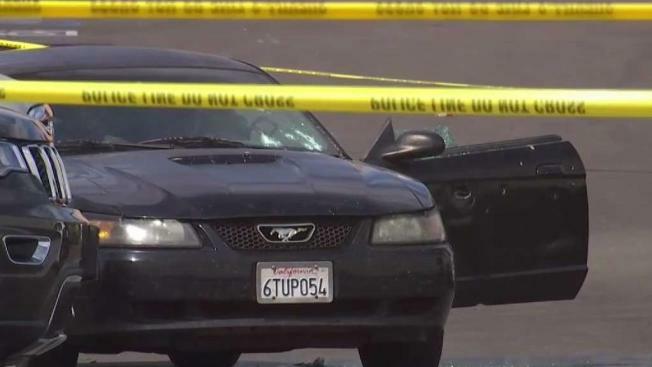 The San Bernardino County Sheriff's Department, which is investigating the shooting, has said Barstow officers responding to a report of a suspicious vehicle believed the driver was wanted for a crime involving a stolen vehicle and attempted a traffic stop in a Walmart parking lot. According to the narrative, Yarber reversed into a police car, then accelerated toward officers and hit a second police car, prompting officers to fire. The grainy cellphone video recorded gunfire but does not show the full incident, the newspaper said. Family members and attorneys point to a portion that appears to show the Mustang moving slowly backward as officers fired. "The car was barely rolling backward. You can walk faster than that," said Merritt, the Yarber family attorney. Yarber died at the scene. A 23-year-old female passenger was flown to a trauma center with multiple gunshot wounds and two other young men fled from the car during the incident, officials said. Yarber, the father of three girls, had prior convictions for escaping police and misdemeanor domestic violence and was on three years' probation at the time. He was recently charged with violating his community supervision. Authorities, however, have not said if the officers knew his identity. The female passenger is represented by attorney Dale Galipo, who said she suffered two wounds that were "life-altering." "The shooting was unjustified, and the police version of events contradicts information in the video and given by eyewitnesses," said Galipo. Barstow spokesman Anthony Riley wrote in a statement to the Times that the department is cooperating with the investigation.